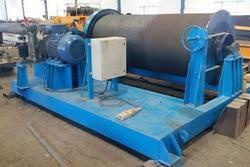 Our range of products include power winch machine. Power Winch Machine have taken the market today. The new Electric Portable Power Winch has considerably reduced the space occupied and made life much easier compared to the older winches. Moving this winch is an easy task now, and they can be used for multiple purposes. Looking at how much better these Electric Portable Power Winch are, one would choose to buy these. It is very important to look for a few common and important features in them to ensure a right buy. in order to get the winch perform better Reduction of Electric Portable Power Winch with self-made Helical reduction Gearbox and the other reduction with open Spur gears and pinions is usually preferred. Steel fabrication with flanges at both ends is the better choice. For those looking for higher capacity, Electric Portable Power Winch of about 220 meter are also found.